For nearly a century, scientists have been baffled by the phenomenon known as hair ice – hair-like ice formations found in the forest during certain times of the year. Now, scientists have discovered that the answer to the mystery may be found in the humble fungus. Though most of us don’t realize it, fungi are pretty incredible organisms. The majority of carbon sequestration in northern forests is facilitated by fungi, clean-burning biofuel can be created by fungi, and fungi can be used to remove toxins such as BPA out of the environment. Not impressed? 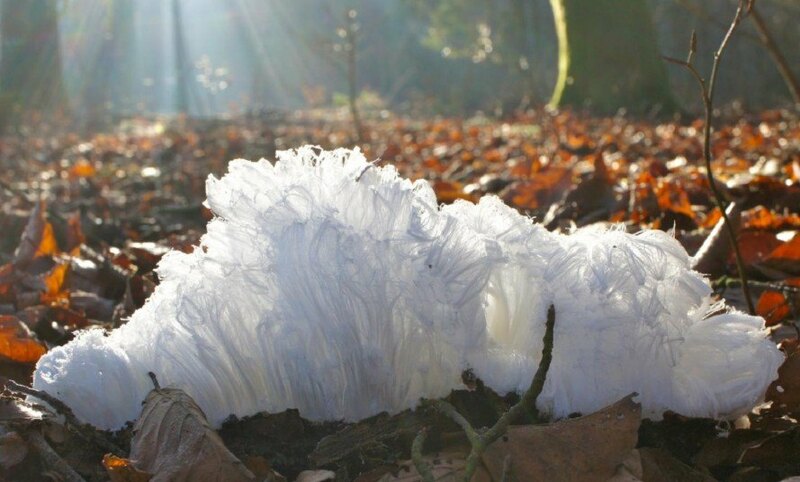 Fungi also play an essential role in building the environment, as scientists recently determined after finding that the beautiful and rare “hair ice” are the handy work of fungi. Hair ice appears on decomposing leaves and wood in temperate, low-latitude forests. Light frosts on humid nights seem to signal to the hair that it is time to grow. A fungal role in the manifestation of hair ice is not a new idea. The man who brought us plate tectonics, Alfred Wegener, speculated that mycelium, the white, root-like network that defines mushroom-producing fungi, was the key to solving the mystery. Almost a century later, Swiss and German scientists have finally proven that Wegener was right. 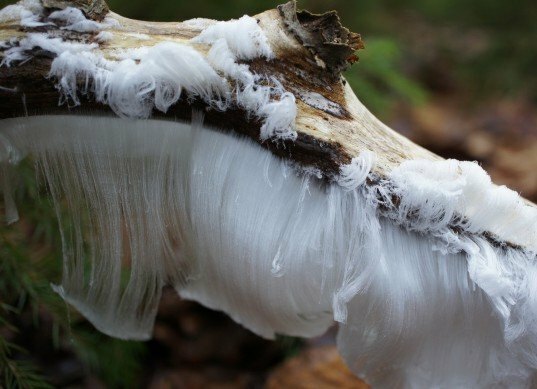 “When we saw hair ice for the first time on a forest walk, we were surprised by its beauty,” says Christian Mätzler, co-author of the new scientific paper explaining the origin of hair ice. “We started investigating this phenomenon, at first using simple tests, such as letting hair ice melt in our hands until it melted completely.” The team used chemical tests to determine that lignin and tannin, byproducts produced by growing fungi, were present in the hair ice. Eventually, they concluded that one particular fungus, Exidiopsis effusa, is responsible for building the structures. The mycelium of Exidiopsis provides support and structure for hair ice, which occurs after a small layer of liquid water is trapped between ice and wood surface. “The same amount of ice is produced on wood with or without fungal activity, but without this activity the ice forms a crust-like structure,” says Mätzler. “The action of the fungus is to enable the ice to form thin hairs — with a diameter of about 0.01 mm — and to keep this shape over many hours at temperatures close to 0°C. Our hypothesis includes that the hairs are stabilized by a recrystallization inhibitor that is provided by the fungus.” Though the researchers may have solved the how of hair ice, why the fungus builds these beautiful structures remains unseen.